Lohan is currently locked in the middle of a constitutional battle with ATT Wireless over customers being able to pay cash for products (namely the iPhone 3G) @ their retail stores all over the country which ATT currently has a polity that only a credit card can be used. The only thing is that ATT seems to ‘have neglected’ the fact the it violates 2 Supreme Court Rulings that all products available for sale @ a store must except legal notes issued by the US Treasury Department as payment for such item (namely cash). Lohan is not letting up and is pressing ATT on the issue. Hopefully Lohan will not have to get the US Attorney General Civil Rights Division involved in the matter! Don’t believe me? Call or visit any ATT retail store! Of all the retailers to find themselves in a heated debate about immigration, Toys R Us is one of the more unlikely ones. But the toy retailer is under some criticism concerning how it handled a newborn’s situation in a New Year’s contest. Toys R Us offers a $25,000 scholarship towards college education for a baby born in the new year. The NY Times reports that three babies were tied for being the first baby: One from Bay Shore, NY, one from Gainesville, Georgia, and one from NYC’s Downtown Hospital, Yuki Lin. Baby Jayden Swain of Gainesville ended up winning the drawing, but Toys R Us disqualified baby Yuki (pictured, with her parents and delivery team) from the drawing because her parents, two 22 year old Chinese restaurant workers, are not legal residents – even though Yuki herself is an American citizen! Leo Y. Lee, 49, an engineer who is past national vice president of the Organization of Chinese Americans, an advocacy organization, pointed out that the savings bond was awarded in the name of the baby, not the mother, and that there was no legal requirement for a rule barring the American-born child of an illegal immigrant. But comments by Ms. Keller, the grandmother of the winning baby, hinted at the wrath that the company risked from the other side at a time when the most stringent critics of illegal immigration have called for an end to birthright citizenship, saying the children born to illegal immigrants are “anchor babies” who encourage illegal entry. Dear lord… Sure, who knows if baby Yuki would have won the drawing if she was still eligible, but it seems like Toys R Us dropped the ball on this one, PR-wise (and they just opened a big store in Shangahi!). It’s complicated and dicey. What do you think? 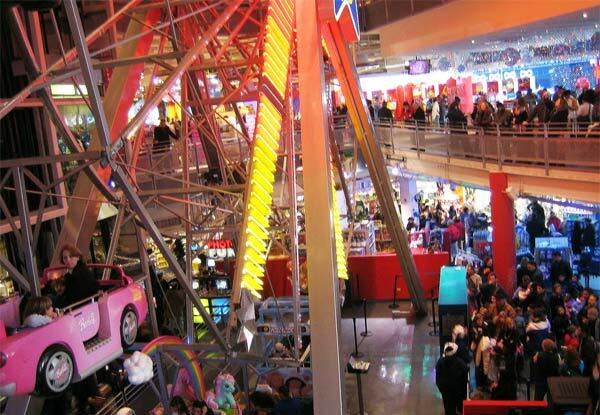 Remember when the Times Square Toys R Us was in a kerfuffle with breast feeding moms? And NYC’s Downtown Hospital delivers more babies than most city hospitals.